This is Alchemy Coffee‘s first year at the South of the James Market, and Eric Spivack has already created quite a following for his espresso drinks and caffeinated conversation. Alchemy was a favorite at the SOTJ Winter Market, and the Summer market has welcomed Alchemy and their iced coffee drinks with open arms. 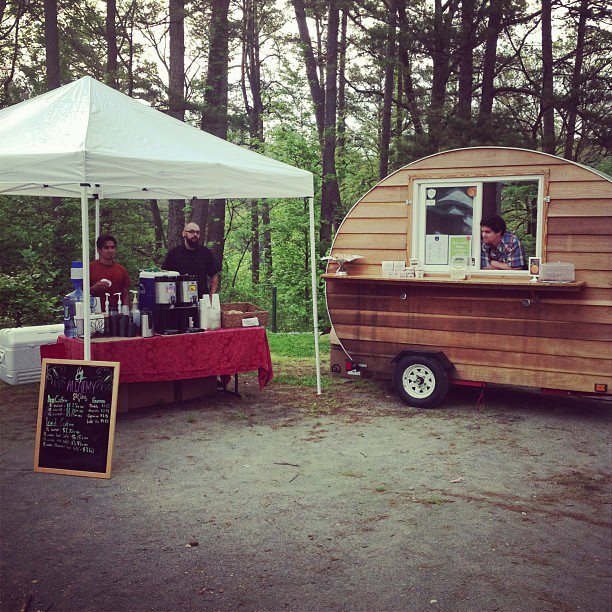 When Alchemy’s not at the South of the James Market, you can find them at the James Center or spreading the joy of coffee around town in their easily recognizable 4×8 trailer. 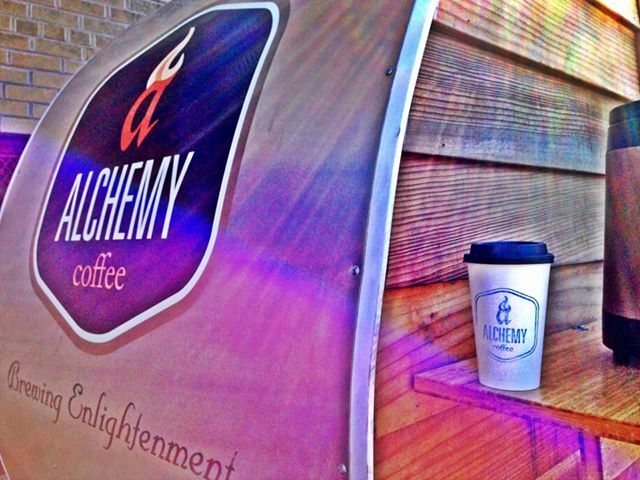 Alchemy Coffee. We sell single-origin drip coffees, skillfully-crafted espresso beverages and light breakfast fare. Our most popular item is the coffee of course! It’s a hit because it’s so distinguishably delicious. Most RVAers have never had a chance to experience the delicate but complex nature of a single-origin drip coffee, or a perfectly constructed espresso beverage. We have been in business since the Fall of 2012. People are sometimes surprised that we are happy to advise customers on how to brew better coffee at home, and even offer home-brewing education sessions in partnership with Blanchard’s Coffee. We are passionate about great coffee and are happy to share that enthusiasm with others. We developed a custom espresso blend using beans from Blanchard’s Coffee and enthusiastically partner with them. Like a lot of vendors, our Saturday starts with prep work during the days prior, such as cold-brewing our drip coffee. Saturday morning we are up early (at our kitchen no later than 5am), loading up our truck and trailer and then make our way over to the market. We typically arrive prior to 7am and begin brewing drip coffee and dialing in our espresso to be ready to vend by 7:30am (early-bird market customers usually want coffee first thing). We are actively vending from 7:30am – 12:00pm, sometimes delivering trays of cappuccinos to the Yoder’s girls in exchange for a box of donuts. Following the market, there’s quite a production to break down and clean. Clean equipment is one of the most important aspects of our operation, given that we’re trying to extract the most delicate of notes from our coffee beans. Coffee oils, if not cleaned properly from equipment, can become rancid and offset our efforts. 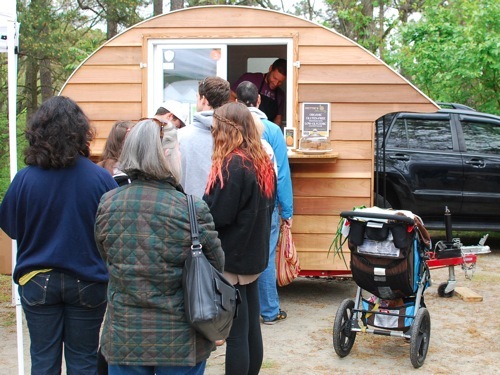 We probably spend almost as much time cleaning up from the day as we do actively vending! Pro Tip: Follow Alchemy on Instagram for great photos and up-to-the-minute info on where to find your fix. Great article! Love market mornings and COFFEE!